Our local Allen's and Anna's hummingbirds love the two Aspect's Jewel Box feeders (I have no affiliation with Aspects, just love their feeder) in my atrium. I get visitors every five minutes throughout the day. I can get some amazing photos when the light is just right and they can't see me on the other side. Thanks for submitting. What a great pic. birds. Jewel boxes are great for photos. 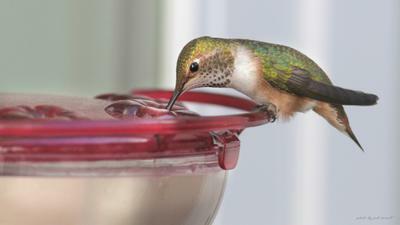 The Jewel Box Window Hummingbird Feeder is our favorite window feeder. See my Review.